LATHAM-- The New York Guard, the state self-defense force, is getting a new look. Beginning in March members of the New York Guard will be wearing the same Operational Camouflage Pattern uniform that members of the New York Army and Air National Guard wear. The change is being made because the digital pattern Army Camouflage Uniform is no longer being manufactured and is harder to find, explained New York Guard Col. Ed Keyrouze, the New York Guard’s chief of staff. This means that as the ACU uniforms wear out they cannot be easily replaced, Keyrouze said. It also means that when New York Guard members need to be issued uniform items for cold and wet weather they cannot be found, he added. Converting to the current pattern uniform alleviates these issues, he said. Because New York Guard members are a state force they wear the New York State flag where a Soldier or Sailor wears the American flag. They wear the New York Guard patch where the unit patch is worn. New York Guard members wear a black patrol cap with gold rank for enlisted members and silver rank for officers. The rank structure mirrors that of the Army. 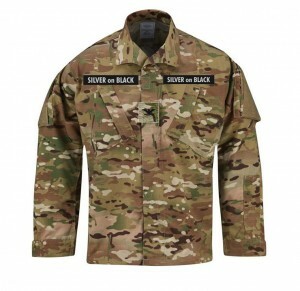 New York guard members will wear black name and service tapes with silver lettering. New York Guard members augment the National Guard during state emergencies. They serve in command posts, in logistics duties, provide short wave radio communications capability, and even provide chain saw training to National Guard Soldiers and Airmen. They train as volunteers and are paid only when they report for State Active Duty. They do not deploy outside of New York. The organization traces its history back to 1917 when the New York Guard was created to replace the New York National Guard when those Soldiers went to France during World War I. New York Guard members buy their own uniforms, except for items issued for special duty. New York Guard members will be able to wear the current ACU-style uniform for up to three years as the OCP uniform is phased in, Keyrouze said.